And now ladies and gentleman, please put your hands together for Ms. Cadiz!! Why do writers write? A question I have been asked many times. Because of the fame . . . If you think like the two strangers living in Germany who REALLY liked your book count as fame then sure, there’s fame involved. Because of the fortune . . . Do overdraft fees imply wealth to anyone?? Being a writer is an interesting choice. And by interesting I mean downright insane. Who the hell chooses to walk down a path where the chances of making it successful are like one to a bazillion? You spend minutes, hours, months, YEARS pouring over a blank screen and blank pages of notebook paper, creating something the voices inside your head told you to do (Cough *therapist cough*), and the chances that anyone will ever actually read it (including your mother) should make you question the path you want to go down before you actually take that step. Being a writer basically means you’re willing to give up all your spare time to pursue the creation of something no one may ever care to read. So why the hell did I become a writer? The simple answer: Because I LOVE stories. The more in-depth answer: Because I BREATHE, LIVE, EAT, DREAM stories. I don’t write for the public. That comes many drafts later. First and foremost, I write for myself. I write to silence the noise deafening my own mind. I write to reignite hope inside my own heart, strength inside my own soul. I write to explore my own inner demons and questions and needs and insecurities. I write to lay myself bare so I can find a way to rebuilt myself. I write to remember that I am so much more than I believed I could be and it’s okay to be so very flawed, so very human. Then I write to connect to another human soul in the hopes that my stories will find an outstretched hand, an open heart, a similar mindset so I know what I have endured, what I have had to carry, I did not go through alone. Plus, writers are friggin’ hilarious and sassy and we fo sho’ like to throw our sarcasm into the world as much as possible. Who doesn’t like a good laugh or a good insult? Especially when it’s told by a hunky, six-pack, chiseled to perfection male lead (Am I right, ladies? *wink wink*). Plus, writers LOVE to be entertained like the rest of the world. I definitely enjoy throwing in some good action and explosions and chases and twists just to get the blood pumping. I decided to become a writer when I was sixteen-years-old and wrote my first book (which is total flaming crap on a stick). I love the POWER of words. How words can build and bend and break and heal. I love the melodies and cadence words make when put together. I LOVE how liberating writing is! It teaches you how to be strong enough and brave enough to find your own voice and use it to shape the world around you, to challenge the world around you, to better love the world around you. I became a writer because—at the core of who I am—is a kid. I still look at the world around me in wonder. I still want to explore and voyage into the unknown, into the shadows where a really real booeyman can live even though it’s terrifying. I still want to believe magic exists not just in the world but in myself. I write because stories are the way I can be free. Free to believe. Free to hope. Free to dream. Ultimately, free to simply be me. Thank you so much Ms. Cadiz for taking the time to discuss your love of writing with us!! This is currently on sale for only $0.99 until May 31, 2015!!! Zahara Faraday looks like a normal eighteen-year-old and lives in a quiet neighborhood with her overprotective parents. She works at a bookstore and hangs out with her best friend Becca King on a daily basis. But underneath the normal lies a secret life filled with dangerous supernaturals. Zahara belongs to a world made of Light Witches, rogue Imagoes (supernatural creatures with super strength, speed, and silver skin when the moon is out), fallen angels, and Nephilim (hybrid children born half-human, half-angel). Where her father Solomon Faraday is human, her mother Mia and her Aunt Catalina are Light Witches. They help protect the human world by hunting down rogue supernaturals who commit heinous acts against humans. What they never expected was the possibility of having to hunt down the one rogue coven they had befriended and come to trust in their battle against Lucifer. Rekesh Saint-Louis is the leader of the most powerful Imago coven in Florida and now he’s the most suspected. Supernatural bodies are starting to pile up with an ancient ritual long forbade being used to murder them and the symbol, one large cross with four smaller crosses around it—which represents Rekesh’s coven— being left behind. Rekesh and the Elders of his coven set out to find who is behind the murders and clearing his name before a war between the covens begins. To make matters more difficult, Rekesh also has to deal with the return of someone he has been keeping a secret. Meanwhile, Zahara and Becca are spending more time brushing up on their training, knowing an attack from Lucifer can come at any moment. Between patrolling neighborhoods and hanging at the boarding school created by Charles Stephens—a fallen angel who created the school to protect the children of rogue supernaturals—they are thrown into one battle after another. Zahara begins to develop a closer bond with Jason as they train and chase down clues to clear Rekesh’s name. What she doesn’t know is the very powerful secret Jason is keeping; a secret that will change the course of the fight with Lucifer. But Rekesh’s coven being set up isn’t the only danger. A new powerful and lethal drug has emerged from the shadows of the supernatural world called Inferi. The drug has two deadly side effects: it leaves the supernatural hungering for blood—both human and supernatural—and grants them the elemental power they had once possessed. 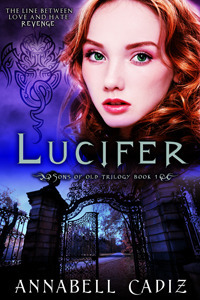 Lucifer is on the move and he will stop at nothing to get his hands on Zahara and complete the first act of his plan. A battle is about to begin. One that may cost the Faraday family everything they hold dear. This is currently on sale for $0.99 until May 31, 2015!!! After the loss of Dustin, Zahara throws herself into taking care of the Howling Café—the café he left to her in his will and fights to keep a rhythm of normalcy with the others. It’s the best they can do since Lucifer has gone underground and any attempts to find him have rendered no leads. Endymion, Prince of the Angel Kingdom, isn’t exactly helping though. Thanks to his brash and arrogant attitude, Zahara finds she would rather stab him with her dagger than hang out with him for any period of time. But she has no choice. Endymion is the only who can help her learn to control the magic threatening to take over her body thanks to his connection to the soul lying dormant inside of her. Nevaeh was once the most powerful Nephilim in the Supernatural Kingdoms and engaged to the Prince himself. She also happened to be Lucifer’s daughter who was killed in the first Supernatural War. Her soul is key to Lucifer creating war again—not just with the Supernatural Kingdoms but with Heaven itself. Endymion is determined to keep that from happening, even if that means destroying the soul of the only woman he’s ever loved so Zahara can live. Complicating things even more—as if they could get any more complicated—is the revelation of an ancient Grimoire once held by Margaret. The Grimorie contains powerful spells passed down through the generations of coven members within the Light Witch community. But Margaret hid it away before she helped take Lucifer down the first time. The Grimoire not only holds the two dark spells Lucifer needs to complete the final phase of his plan but a secret Lucifer never knew about. Zahara and company are in a race to find the Grimoire before Lucifer can but Margaret didn’t exactly make it easy. Seven keys have to be found in order to discover the location where the Grimoire had been hidden. Making matters worse is a new coven that has suddenly appeared in town. A coven made of a variety of supernaturals, all under Lucifer’s command. Life changing secrets will be revealed. The stage for the epic battle is set and not everyone will make it out alive. Born and raised in the sweltering suburbs of South Florida, Annabell Cadiz grew up fine-tuned to the cuisine of various Spanish cultures, learned to master the art of Puerto Rican cooking thanks to her parents, and learned to converse crazy thanks to her band of siblings. She is now working toward attaining a B.A. in Psychology at Trinity International University to better understand how to converse with the weirdoes and crazies of the world. (After all, she is one of them.) A self-proclaimed nerd and a book-a-holic (her room holds dozens of shelves with much evidence to prove that her claims are indeed true), she created TeamNerd Reviews along with her best friend, Bridget Strahin, to showcase their EXTREME love for all things book related. She published her debut novel, Lucifer (Sons of Old Trilogy #1), in January 2013. 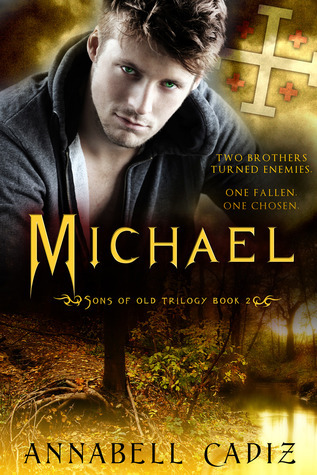 The second novel, Michael (Sons of Old Trilogy #2) will be released on May 28, 2014. 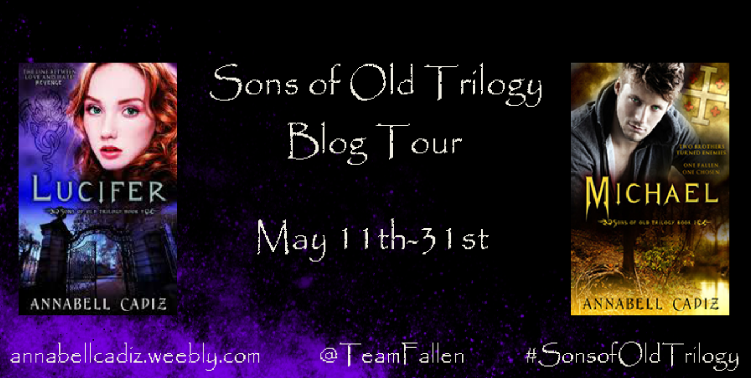 And the final installment in the Sons of Old Trilogy, Nephilim, will be out in Summer 2015.